Situated in Thenkasi Taluk, in Thrunelveli District of Tamil Nadu, on the banks of Hanuman Nadi near Kutralam is Ariyar kudi or Arya Kuti – 'the abode of noble people', popularly known as Ayikudi, is this beautiful temple for Young Bala Muruga Peruman,. 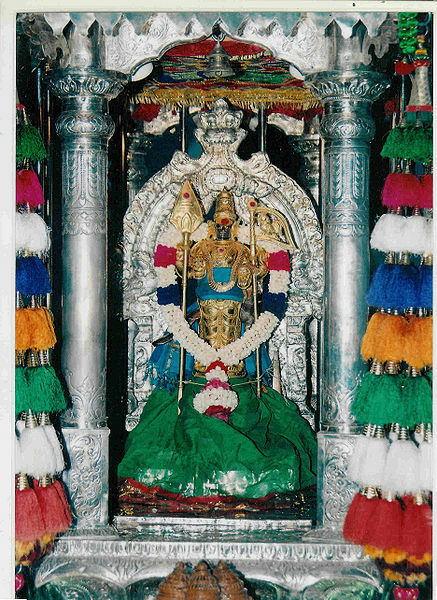 The main deity is a beautiful small mulavar murthy of Balasubramanya Swamy, also popularly known here as Rama Subramanya Swamy.He is believed to have been found by a villager in the nearby Mallapuram Eri (irrigation tank). A similar looking Utsavar Murthy of this temple is Muthukumaraswamy, standing next to a peacock on a Padma peetam. Both the Moolavar & Utsava Murthys are so beautiful that the darshan of Karunamurthi Bala Muruga is a treat to all the bhaktas who visit this temple. This Lord Muruga temple is on the banks of Hanuman Nadi, depicted under five trees. The main Sthala-Vruksha(sacred tree) is Arasa Maram or the Pipal tree. The other four are Vembu – Neem tree, Karuvepilai – Curry leaf tree, Madhulai- Pomegranate Tree and Mavilangu. The importance of this temple is that many Devatha are worshiped in this Sthala (holy site). On the right side of the Moola Vigraha (main deity) are Mahadeva, Mahavishnu, Ambikai, and Ganesha and on the left side of the Moolavar is Aditya (Surya) and these are the Pancha-Devatas of this temple. The main Moolavar Sannadi is of Balasubramanya who is located under the Pancha-Vrukshas and in the middle of the Pancha Devathas. Sri Rama & Hanuman are always remembered on these riverbanks. The temple is known for attaining Karya Siddhi or success in endeavors and Pillaiperu or childbirth for bhaktas who visit and participate in the pujas and sponsor the special offering of 'Hanuman Nadi Padi-Payasam'. On the way in search of Sita Devi, Hanuman was very thirsty. He did not want to go in search of water. It is believed that with the sharp edge of his tail he created a Nadi(stream or a small river) and quenched his thirst. Hence the Nadi here is called Hanuman Nadi. Sri Rama drank water from this Nadi and rested on its banks. Since this temple and the Nadi are devoted to Lord Subramania and Sri Rama, the nama Rama-subramanian is a popular name given to children born in this area. Rama Sita Anjaneya images are carved in the pillars of this temple Mandapam. Once upon a time there lived a Bhakta in Ayikudi Kezh (lower) Agraharam, who become a saint and attained siddhi in this area. His Kaushika vamsa descendants made his Samadhi on the banks of the Hanuman Nadi, where he had propagated Hindu Dharma and his Bhakthi for Sri Rama and Lord Subramanya, and planted the first Pipal tree there. The Balasubramania vigraha was later found and was installed on his Adhishtaanam with Subrahmanya Shadaksharikalpa Agama Sastra traditions and a small temple was built and pujas conducted by the descendant families. Until 1931 the roof of the temple was made by coconut & palm leaves. The Travancore Maharaja who happened to visit this area appreciated the devotion of the villagers and decided to help in completing this temple. In about mid 1800s the temple management was taken up by Travancore Samsthanam and they renovated the temple, building the roof and Gopuram, Mayil Mandapam, Mani Mandapam, Praharams and Padithurais around this with all the Pancha Vrukshas and the Pancha Devatas. Then the Utsava Murti was made and grand festivals were arranged by the government, which the villagers enjoyed and participated. Until 1947 the temple was under the Travancore government management. Earlier days many pundits got down into the Hanuman Nadi and did ablutions in the water. The water was used for ceremonies and ritual cleansing by devotees. The sweet tasty water from this Nadi is believed to cure diseases and maladies and gives complete wisdom and long life to the Bhakta. The Padi Payasam Prasad used is made on the shores from this water. Skanda Shashti Soora Samhara festival, Chithirai Vishu, Vaigasi Vishakam, Masi Makam, Thaipusam are special festivals of this temple. Hanuman Nadi Padi Payasam, Palkudam, Kavadi are important forms of worship in this temple. This temple Arasa Elai Vibhudhi Prasadham that is the holy ashes given folded in a pipal leaf, is very popular and auspicious. This is one temple where several deities are adored and divine Balasubramanya bestows all boons to bhaktas who visit this shrine.